Girl is NOT a 4 Letter Word: HISTORIC!! Women To Receive Same Prize Purse As Men At Combi!! HISTORIC!! 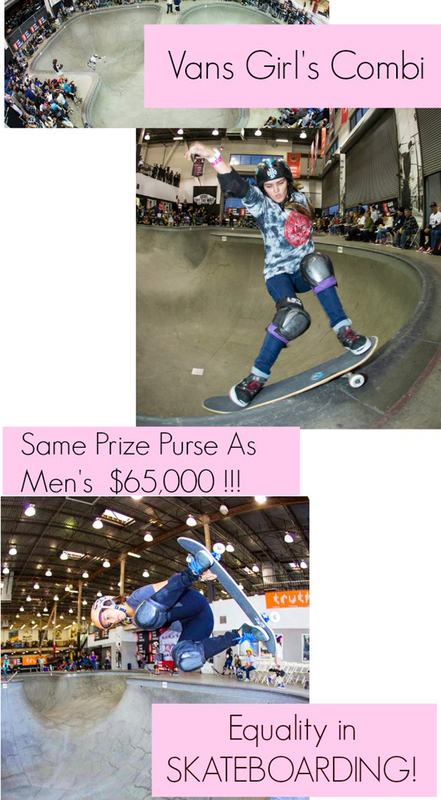 Women To Receive Same Prize Purse As Men At Combi!! Night before Combi come join us at Vans Combi for a fun evening! We are so excited to share this HISTORIC moment (and on Valentines Day no less!) Women's skateboarding is changing and history is being made!! It is my honor to share with you that the Vans Girl Combi Classic will offer a prize purse equal to the purse offered at the Vans Pool Party. All professional skateboarders should have the equal opportunity to compete for prizes that support and uplift their passion, talent and hard work. Additionally, I’d like to invite you, your family and friends to the Vans Skatepark in Orange the evening before the competition to celebrate women’s skateboarding. This evening is dedicated to the pioneers of the skate industry and beginners who just want to come and learn something new with their friends. I am honored to be a part of a community that together, will inspire a new wave of women’s skateboarding progression. Girls Combi New Purse 2018. $65,000!!! !